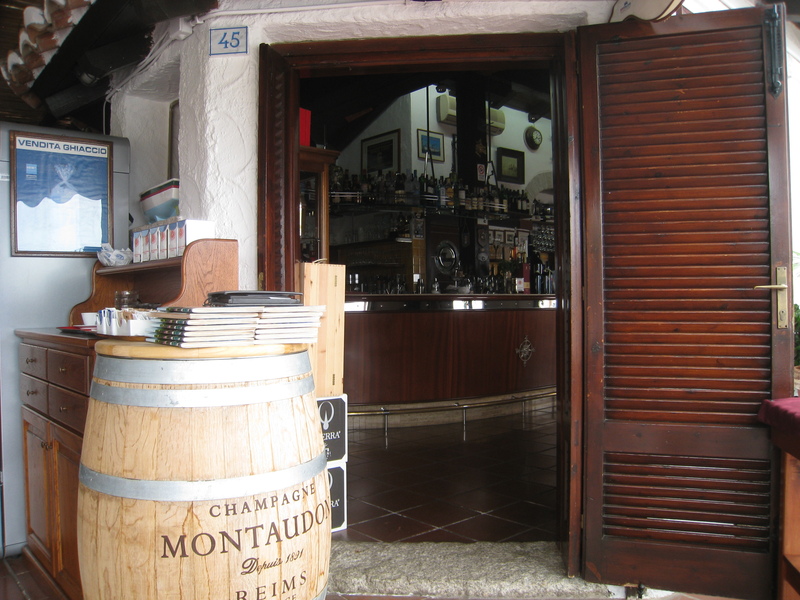 Bars - let's drink chic, Breakfast, Brunch, Cafes, Fish, food, Italy, Restaurants - let's eat chic, Sardinia, Takeaway, Transport - planes, trains and automobiles, Travel - bon voyage! 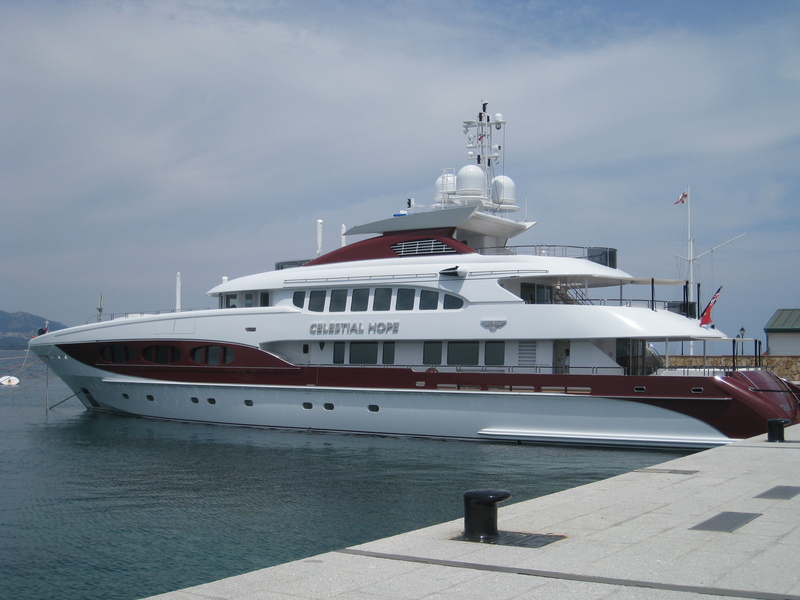 Porto Rotondo is a place of fantasy: an artificial port and marina filled with luxe and super-boats. The one below is charming instead of the usual gin palace that’s the size of a house on water. The sad thing is that these super-vessels only get used for a few weeks each summer. The rest of the time they sit idle, waiting for their pop star/ movie mogul/ politician/ Swiss banker owners to arrive for a bit of show-off time with their loaded friends; a sure case of ‘my boat’s bigger than your boat’. Some, like this one, are real whoppers. Regardless, Porto Rotondo is a beautiful place to visit, an easy drive from the big Sardinian town of Olbia. Bougainvillaea blooms in all directions, the main pedestrian drag of Via del Molo is paved with fish and shark mosaics, crew in matching polo shirts bustle about preparing yachts for visitors and real Pucci maxi-dresses float casually by in the warm sea breeze. You get the picture. 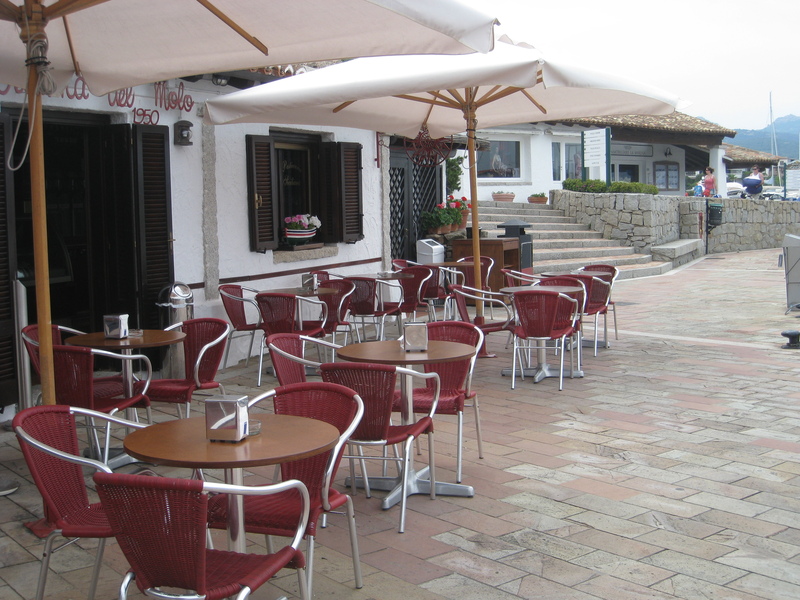 There’s another magnet to the lush sanctuary of Porto Rotondo, though: The Bar-Gelateria Del Molo. Monsieur and I first found the Del Molo when we visited Sardinia three years ago. We loved their breakfasts so much that we decided to fly our new Lear jet over for lunch. (Okay, okay, I lie. We were there again on holiday and found ourselves in the area…No Lear jets at our disposal. Easyjet works perfectly well for us. )We just wanted something quick and light, but ended up going the whole hog with three courses each. 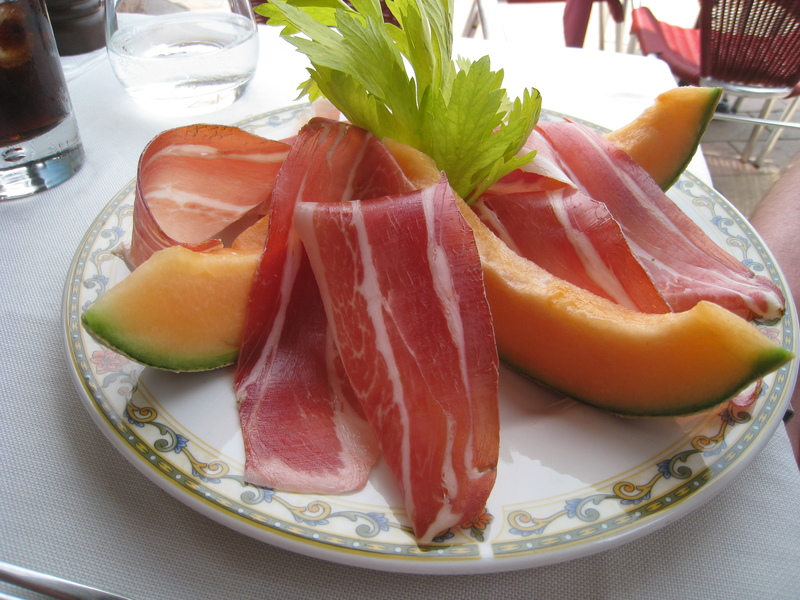 Monsieur kicked off with prosciutto and cantaloupe, the melon perfectly ripe and oozing with juice, the ham deep with flavour. This was no supermarket-shelf ham, but slim cuts with little fat, ever so slightly thicker than parchment. 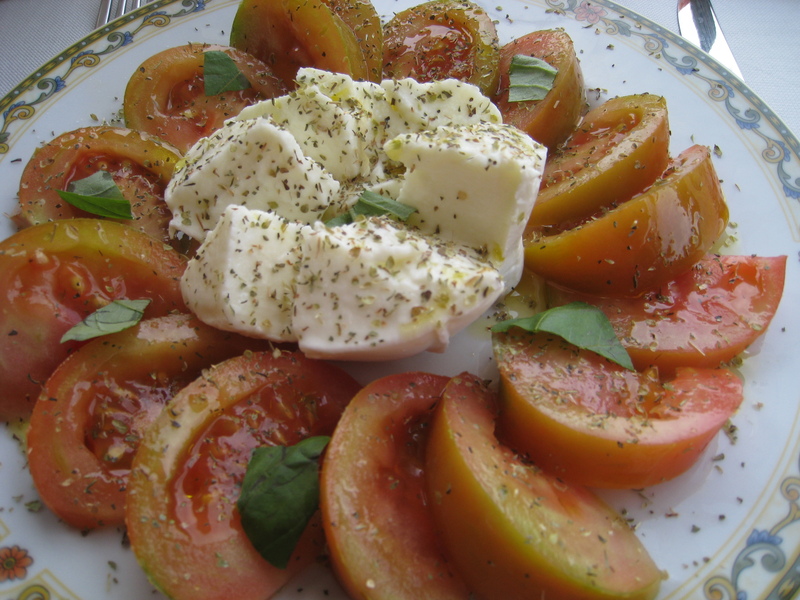 In the mood for cool, fresh, raw food, I chose the mozzarella and tomato salad. Sprinkled with oregano and fresh basil, I splashed some extra virgin olive oil onto the plate and tucked in. Admittedly, the tomatoes were a tad hard – a couple more days on the vine would have done them no harm, but the mozzarella was superb – rich dairy goodness with a consistency part-way to burrata, it stole the show. Once more, only the freshest ingredients were used, including the egg mayonnaise, salad and tender chunks of Sardinian chook. Even the bread was toasted to just the right shade of gold, but it was my main that will go down in the Epic book of all-time favourite dishes: tuna carpaccio with artichoke. I’m a carpaccio queen and I swear to the gods of all things culinary that this was the best tuna carpaccio I’ve ever had the pleasure to eat. I think the trick was in lightly smoking the fish, for there was the vaguest hint of smokiness in the flavour. 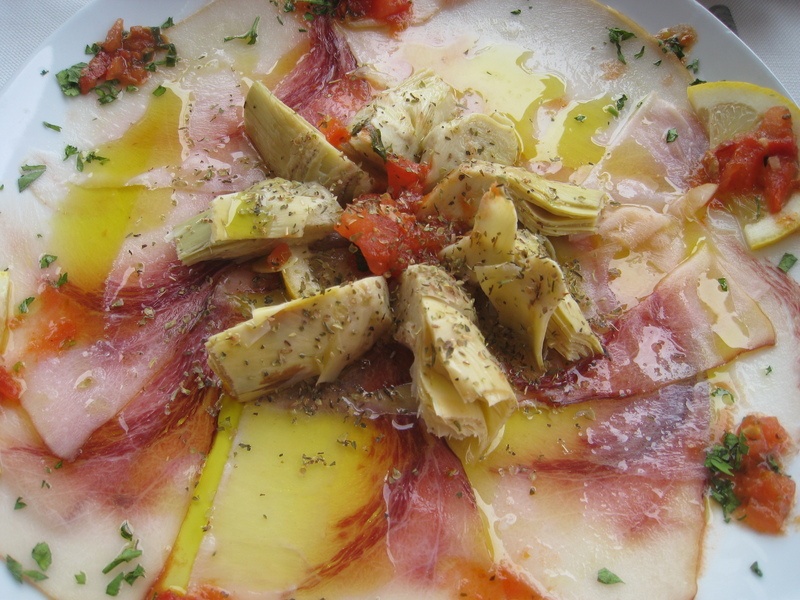 Sliced paper thin, dotted with fresh tomato salsa and preserved artichokes, all of it posing prettily in that same peppery extra virgin olive oil, each tiny mouthful contained a fishlover’s fireworks. At once fine yet unexpectedly fulsome, I ate slowly, allowing it all to seep into my cheeks so that I could hold the flavour for as long as possible. In the greatest gesture of generosity, I forked a bite’s worth onto Monsieur’s plate, keen to share the experience. It will be a long time before I forget such a wonderful culinary treat. Our waiter was a proper character – tri-lingual at least, generally displaying his trio of international skills in the same sentence: “Monsieur, your order, per favore,” or “tutto a posto, Missus, oui? C’est bon?”. Cleverly, this covered all the bases. Now he suggested “un’ gelato, ice cream, glace?” It would have been rude not to, although at €10.00 per three scoop sundae, stabbed with a branded wafer and squirt of whipped cream, the cost was excessive in a country where you can buy decent gelato at a euro a scoop. Still, we bore it with a smile, as the lunch had been fantastic, we were looking out at a stunning marine-lover’s vista, and it seemed sad to leave without something sweet on the tongue. 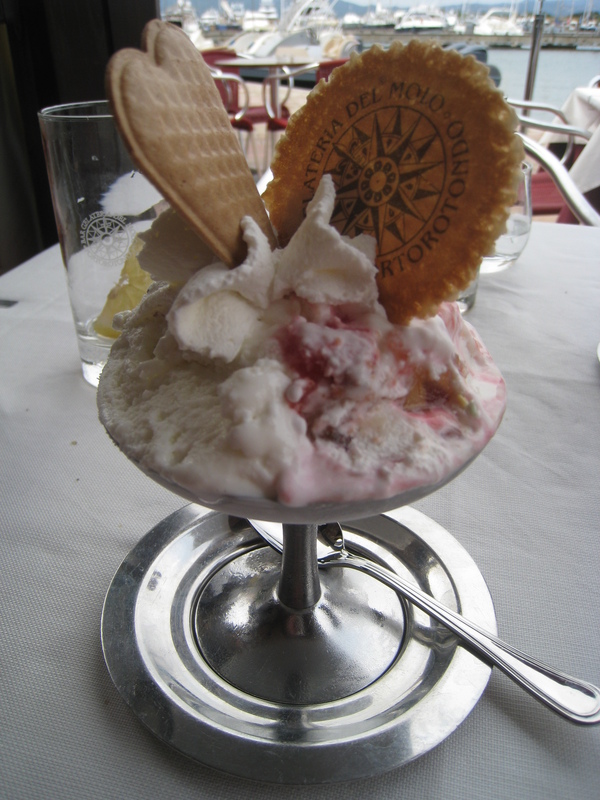 The Sicilian cassata ice cream was excellent. 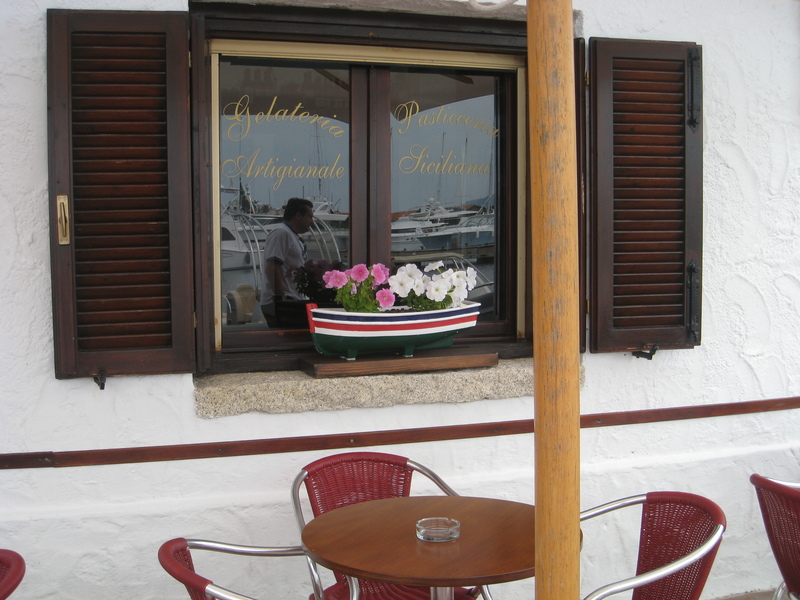 Don’t leave Porto Rotondo without trying it. Homemade glacé fruit makes such a difference. NB If you don’t want to fork out €10.00 for a sit-down sundae, you can always opt for the take-away option for about half that. That’s where I spotted a shelf absolutely groaning with well-thumbed, sauce-flecked cook books. Certainly, this was an expensive visit at around €90.00 for just the two of us, including diet cokes and bottled water but no wine or alcohol, yet for the memory, it was definitely worth it. As for the tuna carpaccio – it’s the stuff my dreams are made of. Bar-Gelateria Del Molo – Walk all the way down the Via Del Molo until you reach the water. The Del Molo is tucked just around the corner on the right hand side. Local phone number: 0789 34338. 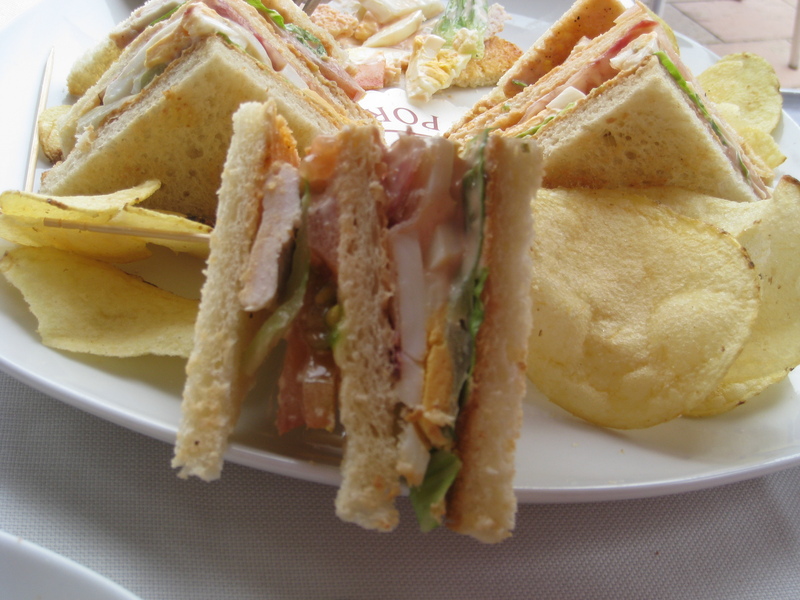 Click here to see my last post about the Del Molo, where I talk about breakfast.